A lovely scene. 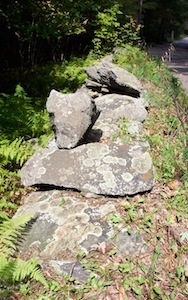 A traditional wall built from new stone, likely culled from a gravel quarry operation or a construction site. Smithfield, RI provides a good model. 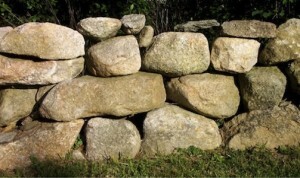 They have passed a stone wall ordinance that other towns are modifying to suit their local needs. It’s not perfect, but it’s certainly better than nothing. Government agencies at all levels have contacted the SWI for advice. Please feel free to do so. Protection is usually being implemented through amendment and revisions of town planning and zoning documents, or through a town’s official plan of development. The revisions usually involve subdivision regulations, building codes, and various ordinances. The revisions often work by including stone walls into a previous list of criteria (or planning elements) that were part of routine environmental assessment prior to development. For example, subdivision regulations usually require that attention be given to special historic landmarks, archaeological sites, wetlands, aquifers and other factors. Adding stone walls to such lists is fairly straightforward. Residents and towns are also asking their state representatives to sponsor enabling legislation, which would allow towns to back up their town land-use protections with respect to stone walls. State and federal governments are adding greater measures of protection for old stone walls on their properties such as parks, forests, landmarks, scenic roadsides, and preserves. Because stone walls often coincide with legal property boundaries, surveying regulations are increasingly recommends their protection. Old roadside walls are especially in need of protection because they must be maintained against vegetation enroachment.